Jaffrennou made his first harp as a copy of the Dolmetsch “First clarsach”, made by Arnold Dolmetsch in 1932 for Heloise Russell-Fergusson, a Scottish harpist. Dolmetsch was a harpsichord maker and the geometry and scaling of his harps follow established practice in harpsichord and harp design. Interestingly, Jaffrennou’s first harp was said to have been a failure. He seems to have been more happy with subsequent designs; the drawings for a Bardic harp that he published in his English-language book Folk harps (1973) presents a design with a distinctive (and problematical) even scaling. 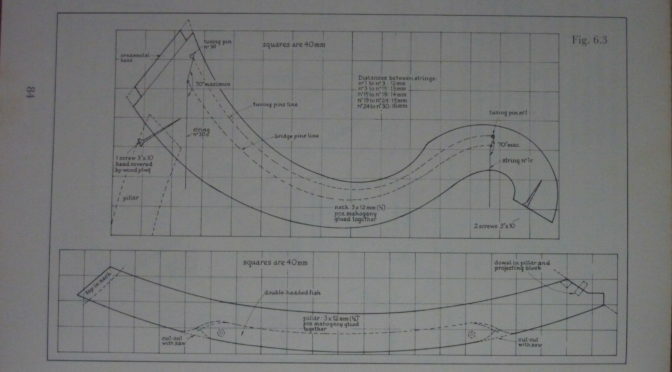 In Paul Dooley’s Galpin Society Journal article (2014 p.125) he includes a chart which compares the scaling of the Trinity College harp with an idealised “Pythagorean” scaling. The Pythagorean ideal has the length of the strings increasing exponentially, doubling every octave. If this is done, then the harp ends up very tall to accommodate the bass strings; the Egan Society harps do have this kind of scaling for most of their range and their bass strings are indeed very long. The three medieval harps closely follow the Pythagorean ideal from the treble down to almost half way; after that the string lengths increase almost in a linear way. This makes the tenor and bass strings very much too short, and this was the reason that Ann Heymann originally suggested precious metal strings. You can see that the modern French harp, by contrast, does not follow the Pythagorean scaling at all. Instead, what happens is that the string length increases in an exponential fashion, but at a slower rate. This means that all of the strings are too short, except for the very highest. This is especially a problem for the treble and mid range, since these strings are more sensitive to their length and scaling – it is not hard to change the metal or gauge to get short bass strings to sound well, but it is almost impossible to get the short trebles and midrange strings to speak well. So where did this idea come from, to make a harp with a slow but even exponential scaling? I suspect that Jaffrennou or other Breton harpmakers developed the idea in the mid-20th century. Jaffrennou explains in his book Folk harps (p.91): “Pythagoras’s experiment is only valid with strings of the same gauge and equally taut. If a harp was made that way it would be too tall, and almost impossible to play”. 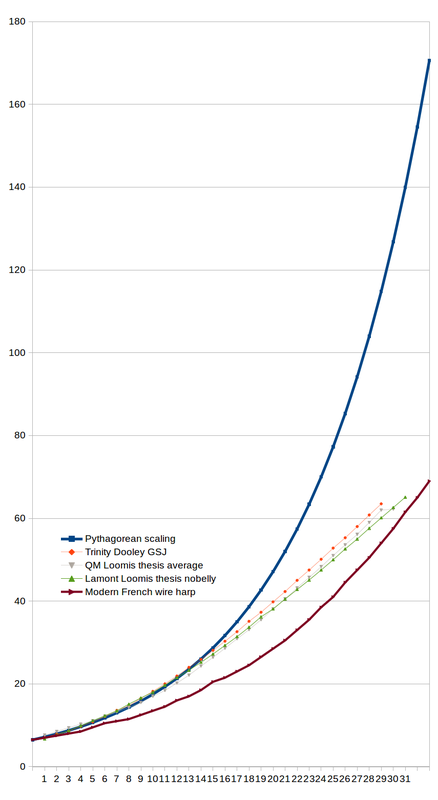 His list of gauges changes every string in a fairly progressive way, and I am guessing that this theorising led him in this misguided direction of a too-slow exponential scaling. Once again, the old craft tradition of the old harpmakers had it worked out by rule of thumb. An archaeological replica, copying the string lengths angles and spacings of the original would be a lot easier to set up and tune, than these modern designs. Very cool article, thank you! I just looked at the Jaffrennou book after reading this. It looks like his bardic harp has 24 strings with the lowest note C below middle C. If you plotted the bardic harp string lengths would they be left shifted relative to the modern French design? This might put them closer to the Pythagorean lengths. It wouldn’t change the rate and the bass would still be too short but more of the mid range might be in the right place. I may be misinterpreting, thank you!